Born to Murrel and Hilma Haas of Oberlin Kansas, Rodney, and his older brother Larry spent their youth in Hollister, Ca. Rod married Verna Lee Winkle on January 1, 1956. He was stationed at Tyndall AFB and served out his enlistment in Panama City Florida, where daughter Cheryl was born. Rod was a celebrated Left Guard for their football team. He was honorably discharged in 1959 and moved his family to Visalia California where he began working as a parole officer. While living in Visalia daughter Carri was born and Rod developed a lifelong passion for Judo. He also attended College of the Sequoia’s where he earned an associate’s degree in criminal justice. In 1970 the Haas’ settled down in a one bedroom “cabin” on Triangle Rd in Mariposa. In 1971, son Casey was born. Rod built a dream home for his family there, doing most of the work himself. Rod was a 4th degree black belt in Judo who competed nationally and was at one time ranked #3 in the world in his weight class. He was the AAU National Champion in 1971 at the age of 34. 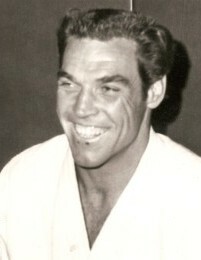 He shared his love for Judo with friends and coached well into his 60’s. Rod would eventually retire from the California Youth Authority in 1988, after serving as a supervisory consultant and peace officer. He was extremely proud of his 28-year career. Rod took great pride in watching his kids and grandkids compete in all manner of sports, which was undoubtedly his greatest passion. Rod is survived by his 4 children, 10 grandchildren, and a great grandson. Memorial Services will be at the Mariposa Funeral Home on September 11, 2018 at 11:00 a.m.